CARA’s College Allies program addresses college retention for first-generation college students, low-income students, and students of color by training college students to support their peers through the obstacles to graduation. 22% of students who enter CUNY community college graduate within 3 years and 55% who enter a four-year college graduate within 6 years. Once students get to college they face a myriad of obstacles: registering for courses, securing needed-services, navigating financial aid, and sifting through an overwhelming number of majors. Unfortunately, caseloads for college-based advisors are often too large to provide students with the support they need. Peer Leaders acquire a range of skills and content knowledge that they use to help students in their own communities to improve their educational outcomes, while at the same time improving their own. CARA provides Peer Leaders with 70+ hours of training where they develop the skills and knowledge to support students through critical retention tasks, help them to develop campus navigation skills, and ensure that they integrate into their campus community. CARA collaborates with on-campus and community partners to help support the integration of Peer Leaders into existing retention programming. CARA helps program leadership to integrate a peer-to-peer component into their retention program. 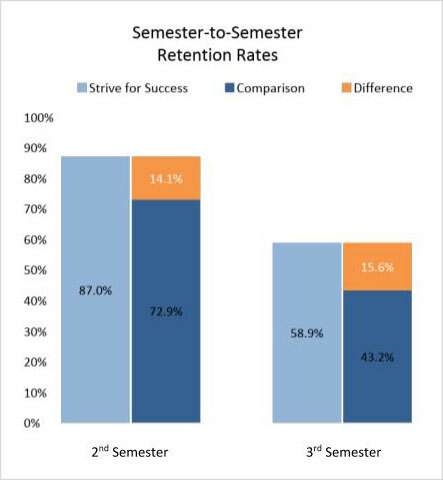 In 2014 CARA collaborated with Graduate NYC and LINCT (now CUNY K-16 Initiatives) to develop Strive for Success (S4S), a peer led retention program that worked in collaboration with a variety of CBOs and was based on select CUNY 2-year campuses. CARA trained over 150 Strive for Success Peer Leaders to support students to complete tasks critical to retention. In 2016 CARA partnered with ASAP – a program designed to improve graduation rates at the CUNY 2-Year programs – to develop and grow a peer-to-peer component of its retention model. ASAP assists students in earning associate degrees within three years by providing a range of financial, academic, and personal supports including comprehensive and personalized advisement and career counselors. CARA has trained over 70 ASAP Peer Leaders, provided professional development to ASAP Peer Leader supervisors, and supported ASAP leadership in the design and implementation of their peer leadership model at nine CUNY Campuses. CARA’s partnerships with Strive for Success and ASAP paved the way for us to partner with a growing number of CUNY and CBO-based retention programs to develop a peer-to-peer component to their models, beginning in academic year 2018-2019. "It kind of pains me to think where I would be now if I didn’t have the ties with my CBO and with Strive." "There were just so many problems I had - so much unpreparedness especially during the transition from high school to college… I definitely felt overwhelmed … Being an SSL [myself now] - when I see students I helped out in the past - my heart skips a beat to know that I am helping someone and in turn they are helping me." A recent analysis of Strive for Success showed that students who were highly engaged in the program (e.g. met with their mentors seven or more times throughout the year) were retained at a 15.6% higher rate than a matched comparison group. Let us know you're interested in learning more about College Allies.